I am so impressed by the progress of this unlikely film project, The Wars of Other Men by Mike Zawacki, that I just have to take some time to write about it. This little short film continues to impress and surprise me — and has from the very beginning. I probably shouldn’t call it “little”, for although it is a short film — about 26 minutes — The Wars of Other Men (or “TWOOM”, as we insiders affectionately call it) is BIG in so many ways. It packs a wallop for its small size, and the producers got a pretty big bang for their buck — because “a buck” is about all I think they spent on it. But, more on that later. The quick backstory is that I know Mike Z. and producer Connie Mangilin from the independent filmmaking scene in Detroit. We met while working on the (infamous?) In Zer0 project several years earlier. I really liked working with Mike on the In Zer0 episode he directed. So, when Connie contacted me on facebook about auditioning for TWOOM back in March 2010, and told me it was Mike Zawacki directing, I didn’t have to give it a second thought. And after reading the script, it was a no-brainer. It was a solid, well-told story that I could easily envision from the script. So, I went to the audition. I read. I was hired. I signed the release papers. Enough about me. Even with the great script and the cool director and the ambitious producer, I didn’t really know how cool a project I was getting into until I met everyone involved. From the first production meeting I attended, it was evident this was something different than the usual let’s-get-our-friends-together-and-make-a-film-for-our-reels sort of project. Cast and crew alike were crowded around a 30- or 40-foot table for a standing-room-only meeting at the studio of Sarah Lapinski, our Costume Designer. It was cool to discover how many “departments” there were to the film — there was going to be an actual orchestra recording the music, special effects make-up as well as CGI, and old-style weapons & costumes & props — and to find out how many of the people involved had Hollywood film credits on their resumés. Oh, and did I mention that none of us were getting paid? Not only were folks bringing their vast and varied backgrounds and experience to the project for free, they also brought along their own equipment, assistants and interns, goals and dreams, and a truckload of passion. As we went around the room and took turns introducing ourselves, people expressed the importance of this chance to express themselves and be creative, to have a solid example of their work in their portfolios and have that work seen, and to be a part of something great. It became clear that we were all not only doing this for the sake of respective various arts, but that each person’s dream, contribution, image, and reputation were in the hands of everyone else, and that we couldn’t afford to let each other down. We were about to engage in a huge Labor of Love. And so it was. Production was a few intense weekends of increasing camaraderie. There were bumps and annoyances and problems to be solved (it was film making, after all), and our rag-tag film crew was looking more rag-tag than the characters in the film. But over all, we laughed really hard while working really hard, and took really good care of each other as we alternated between freezing and sweating our parts off in the ever-changing weather—the hourly, epic battle between the forces of Winter and Summer known as Michigan’s Spring. Screech go the brakes. Filming ends, and cue the elevator music as we enter the long, impatient thumb-twiddling season for actors know as “post-production”. The most many of us heard about the film for a while was that it was being edited, and that our special effects guy, Kevin Capizzi was doing all the effects by himself on his Mac, so it was going to be a while. However, we would definitely have something to see at the scheduled cast and crew screening in October. We settled in our seats at the theater, and watched a few other short films from the producers and director to warm up. Then our “feature presentation” began. When the music kicked in with the title credits, my wife the music producer raised her eyebrows in pleasant surprise. (She’s hard-to-impress when it comes to sound.) The horns were so rich you knew it wasn’t synthesized. The picture so clear and sharp, I couldn’t believe it was recorded on that little nub of a camera that looked more like it belonged around the neck of a reporter than on the end of a boom mount. (Can you say Cannon 5D/7D?). Waitaminit! Was that a tank driving down East Grand Boulevard?!? How did we get that? Explosions and gunfire? I don’t remember any explosions on set. You can do all that with one guy and a Mac? Who cared that the film wasn’t even finished yet?! I think it’s fantastic to realize that you don’t need money to get quality projects done so much as you need human endeavor spurred by the right incentives. Which could indeed be money, or even fame, but in our case, much of it was simply the reward of having a hand in making a good film. More than a year has passed since that initial impression, and this film continues to impress me. The latest development is the most recent push to get the film seen by the masses. The film is just about complete, and most of the CGI special effects are finished, but, in order to get the film seen at film festivals and conventions, the producers needed to raise money to cover a few expenses. 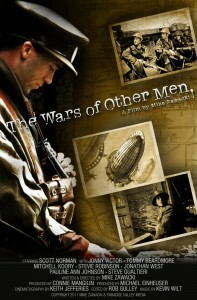 They started a KickStarter campaign for The Wars of Other Men, and set a target of raising $3,000 in 30 days. Well, the response has been overwhelming. Within the first two days, supporters collectively pledged almost $2,000 — over 60% of the hoped for amount. After a slow and steady climb, two angels came in the wee hours of Christmas morning to catapult the pledges past the $3,000 mark. Success! The steady climb continued, and here we are in the New Year of 2012, with over $4,000 in pledges and about a week to go in the campaign. I’m so proud to be a part of this big little film. If you want to know a little more about the project, click on that Kickstarter link above (or below) and watch the video. After the short trailer is a cool presentation by Mike Zawacki about the making of TWOOM. I think you’ll find the backstory in it interesting. And, if you decide to kick in a couple of bucks to the project, you’ll not only be a part of something really special, but you will make a group of filmmakers in Detroit very happy.